With the country's first Catholic Settlement, the State's first Biological Lab, an important archeological conservation lab, a Naval Air Station, ancient fossils for the taking, incredible kayaking and a burgeoning food scene, this unsung, but incredibly important region -- within an hour's drive of Washington D.C. -- won't be unsung for long. Both Calvert County and St. Mary's County in Southern Maryland are bounded by water. The Patuxent and Potomac Rivers and the Chesapeake Bay have been vital to the region's economy since John Smith logged his travels here in the early 1600s. 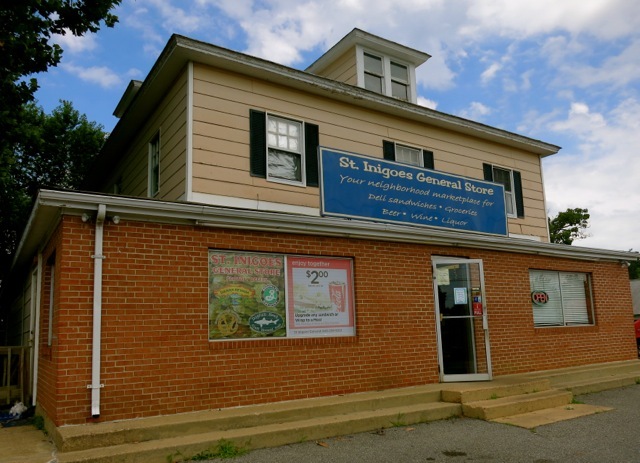 And while towns on the "Eastern Shore" of the Chesapeake are better known, there's something quite satisfying about spending time in this quiet, "can't get there from here" section of Maryland. With the country's first Catholic Settlement, the State's first Biological Lab, an important archeological conservation lab, a Naval Air Station, ancient fossils for the taking, incredible kayaking and a burgeoning food scene, this unsung, but incredibly important region -- within an hour's drive of Washington D.C. -- won't be unsung for long. 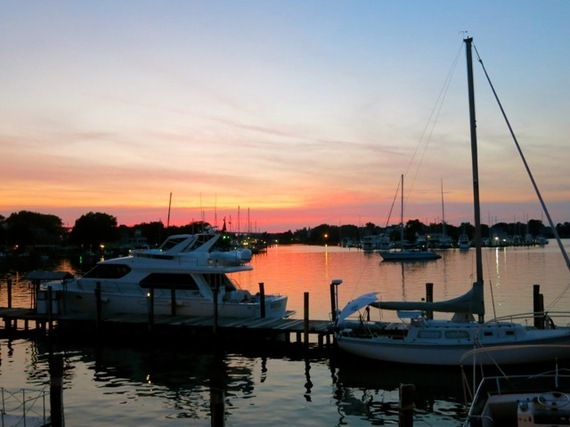 Here are the Getaway Mavens top picks of things to do in Southern MD. 1. Be an archeologist for the day at Jefferson Patterson Park in Calvert County. Though little known outside the field of Archeology this 560-acre park and museum encompasses one of the most important archeological digs in America, unearthing finds from 12,000 years of human occupation. Even better, anyone can participate (for free!) on select days in May and June, either by helping to dig or by cleaning and washing the just-found artifacts. 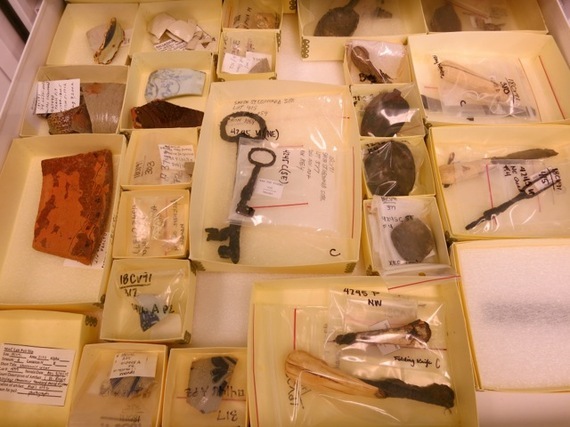 Tour the property, which includes a great Visitor's Center and the famed Maryland Archeological Conservation Lab (MAC) for a behind the scenes look at some of the 8 million unearthed and preserved artifacts. 2. 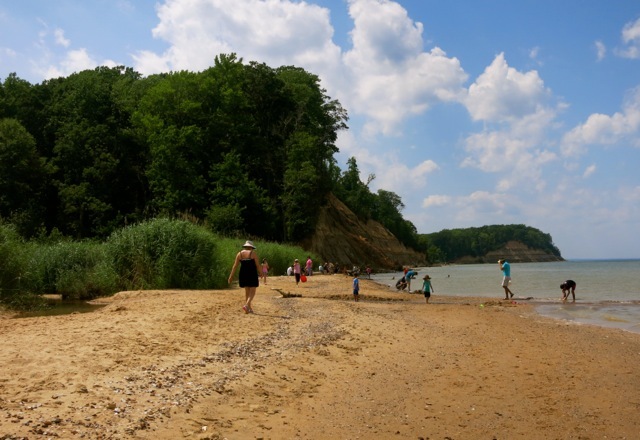 Hunt for ancient sharks teeth at Flag Ponds Nature Park or the Calvert Cliffs State Park. During the Miocene Era, Southern MD was a shallow sea that served as a "shark nursery." Since sharks loose ten to twenty thousand teeth in a lifetime, millions fell to the sediment at the bottom of the ocean. The water receded, leaving the bays and rivers we know today and, here at least, one very unique feature: sandy cliffs in which these fossilized teeth are trapped until the effects of wind and water release them. Bring a sand sifter, sit at the waterside and then take your finds home with you. 3. 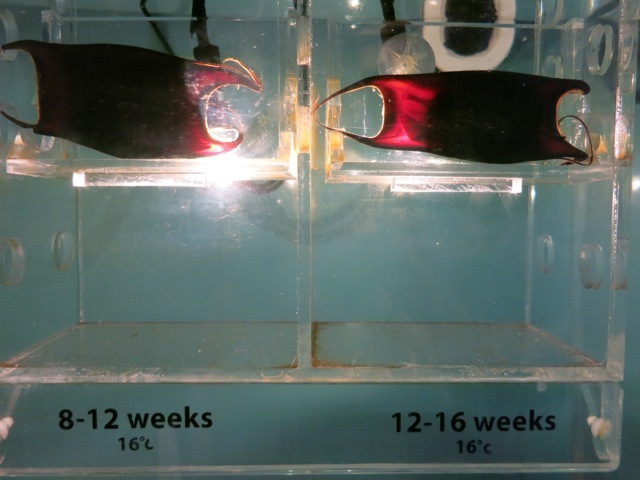 Watch a Sea Ray hatch from its pod at the incredibly fun Calvert Marine Museum. What sets this museum apart from other Maritime Museums on the Chesapeake are the "critters," and the very user-friendly history exhibits built in house. You'll also see just-found fossils undergoing a "DSI" (Death Scene Investigation) in the Smithsonian-affiliated Prep Lab, a model of the original "Showboat" (which actually plied the Chesapeake, not the Mississippi River), and plenty of fish and wildlife here. Kids will love the Shark-Teeth sandbox: the museum gives away 15,000 shark's teeth a year. 4. 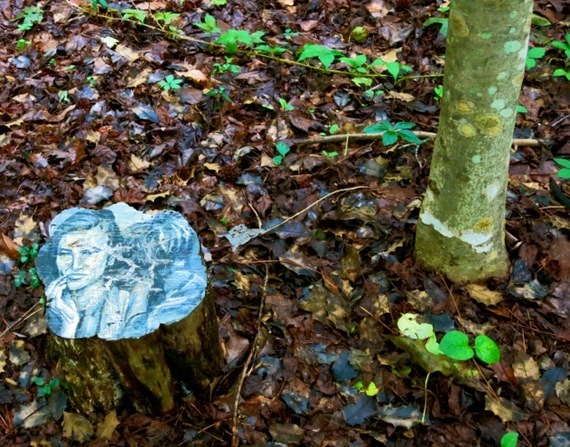 Discover hidden art in trees and trunks at the Annmarie Sculpture Garden and Arts Center, Solomons. Given to the county as a gift, this 30-acre parcel of land showcases thirty pieces of world-class art (on loan from the Hirshorn and National Gallery of Art) and hidden tree designs on a quarter mile woodland path. 5. 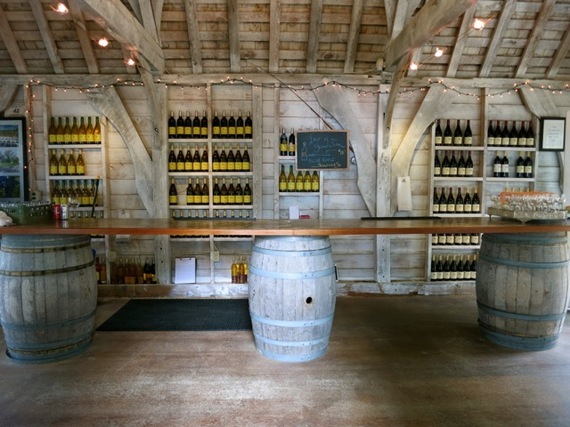 Take a yoga class then enjoy a glass of award-winning wine at Perigeaux Vineyards and Winery in Calvert County. In it's 10th vintage year, Owners Mark Fleming and John Behun make only traditional European wines, many of which have won prestigious awards. The spiritual and gently motivating Loretta Dove (Blue Earth Yoga) leads calming hour-long classes every Tues and Thurs eve (around 7 p.m.) either outside or in the former tobacco tenant house, now a charming tasting room. $12 for one-hour yoga and glass of wine. 6. If still available, try the limited edition Hubble Pace Telescope 25th Anniversary Belgian Triple -- commissioned by NASA's mega space telescope -- at Scorpion Brewing. With a background in physics and astronomy, and contractor for the Navy, Scorpion owner Brian Dailey embraces experimentation in his small microbrewery. He sources hops and barley from local farmers, and it's his intention to obtain all ingredients for his beers "within a five mile radius" of his brewery. 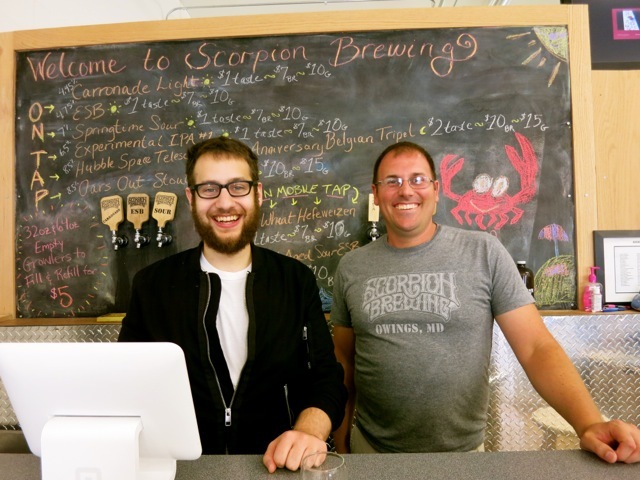 For now, Scorpion's Oars Out Stout and ESB are best sellers. 7. Try out a new brew on "Small Batch Sunday" at Mully's Brewery. 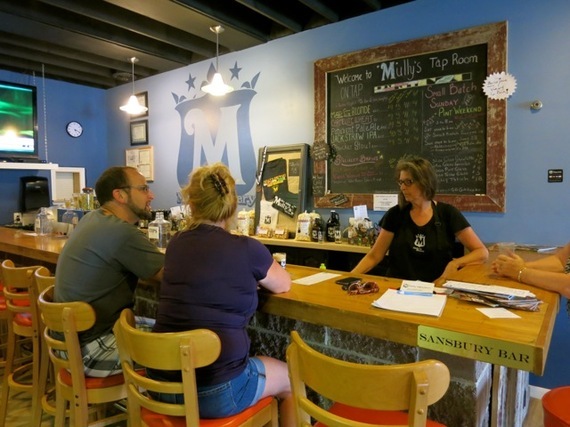 Jason and Cindy Mulliken (nickname "Mully") have been growing this family owned brewery since it opened in 2013. Most fun are "Small Batch Sundays" -- where new 10-20 gallon brews are tried out on the public. 8. Steer your boat or car to the Back Creek Inn, Solomons. 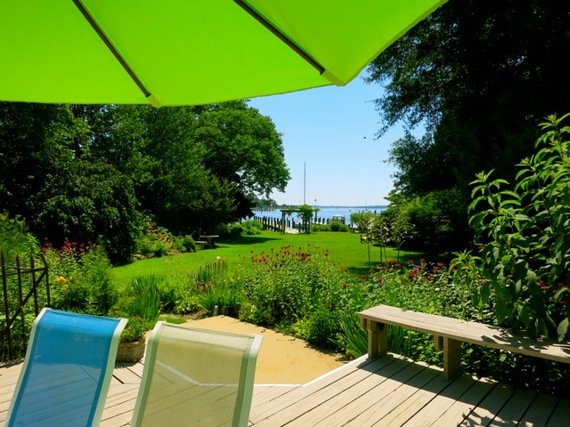 You won't be able to resist the "creek" views from the backyard of this charming 7-room inn. Best are sunsets from the garden patio and incredible gourmet breakfasts served in a charming dining room. Owner, Carol Pennock makes all guests feel welcome, including those who arrive by boat. 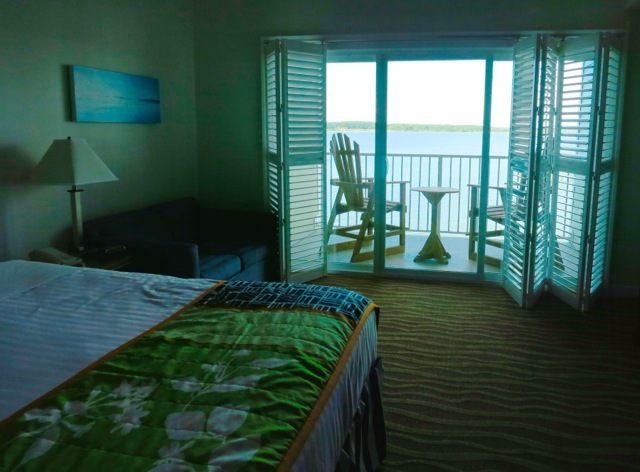 For those who'd like a more traditional, full-service stay, book a recently updated room at the Holiday Inn Solomons, which also has its own marina. 9. Pull crab traps and tong for oysters with a real "Waterman." Saint Mary's County, is so identified with oysters and crabs, it hosts the annual National Oyster-Shucking Contest, from which the winner goes on to Galway Ireland for the World Oyster Opening Championship. 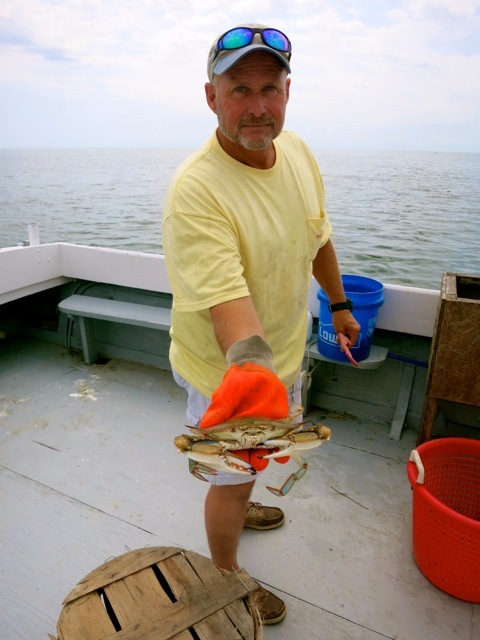 Recognizing the potential for tourism, Captain Phil Langley, transitioned from waterman and farmer to Charter Boat Captain, and also to guiding Watermen Heritage Tours on his Bay Boat, the Lisa S. You'll learn the difference between females (Sallys) and males (Jimmys), along with the history of the Chesapeake, as you lift crab-filled cages from the water. 10. 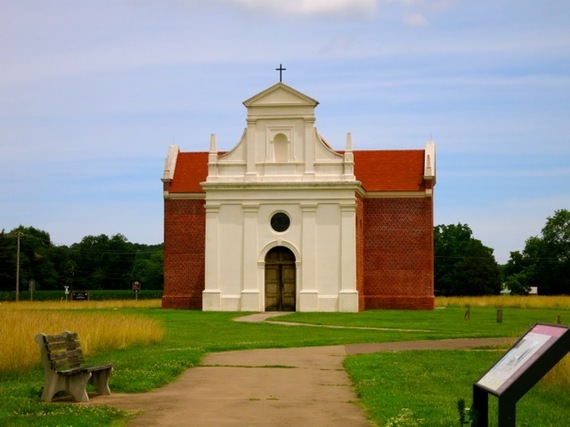 Historic Saint Mary's City should be a pilgrimage site for every Catholic American. As Catholics were being slaughtered in England, 140 faithful arrived here in 1634, and established the first Jesuit Church in Colonial America in 1667. St. Mary's City grew for sixty years, then vanished into the cornfields and was lost for 200 years. By 1776, only plowed furrows marked the landscape. Now, archeologists are unearthing evidence of original structures, allowing historians to recreate buildings with complete accuracy. 11. Rent a kayak with Patuxent Adventure Center (PAC Adventures), and embark on a stunning woodland river paddle -- McIntosh Run -- into the still waters of Breton Bay (2.4 miles). You'll begin just out of town near Leonardtown Winery and end up at the new Leonardtown Wharf -- a brand new waterfront park. 12. Sip "jammy" Bordeaux blend Black Drum Red and other succulent wines in the adorable "Wine Tasting Cottage" at Slack Winery. On wedding venue, Woodlawn Farm, property the landscape will also take your breath away. 13. 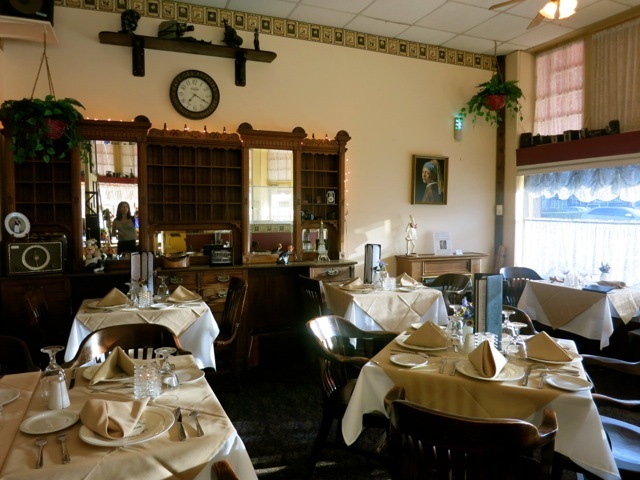 Have dinner at Café des Artistes in Leonardtown. French-born chef, Loic Jaffres puts a "Maryland spin on classic French dishes." Of course, you'll find Foie Gras and Escargot on the menu, but also Crab and Corn Crème Brulee and Chicken 'n Crab in this pretty, white-linen tablecloth, candlelit restaurant. 14. 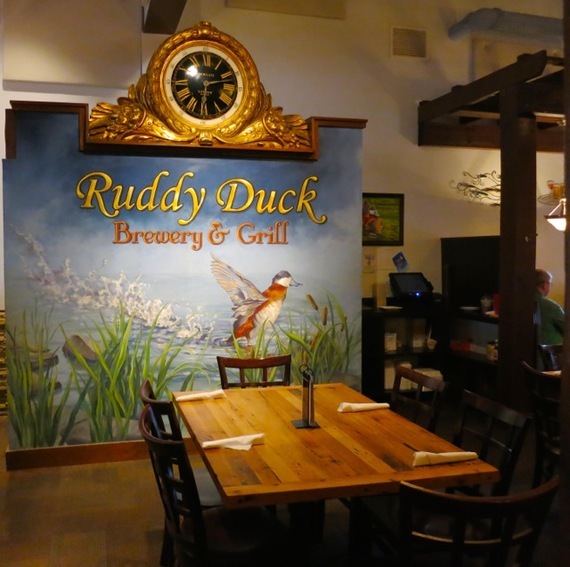 Eat upscale pub food and drink a homemade beer at one of two Ruddy Duck Restaurants. In St. Mary's County -- the RD is the only game in town, at the entrance to the rustic, residential and very quiet St. George's Island. Though remote (it shares a parking lot with the Island Hotel -- see below), you'll most likely have to wait for a table. Though Ruddy Duck in Solomons is on a busy road, the fresh brews are fantastic, and "Duck-a-dillas" are killer. 15. Sample one of the most unique and eclectic collections of rare sodas at the very nondescript St. Inigoes General Store. Boxed lunches are better than most -- fresh and perfect for a picnic table or boat cruise -- though butterscotch, glow-in-the-dark and other sodas will blow your mind, even if modest owner, Tim Blasko, thinks its no big deal. 16. Check in to the 28-room Island Inn and Suites, and you'll be forced to answer one question: "do want sunrise or sunset views?" Wedged between the Potomac River and St. George's Creek, you can't really go wrong with either one. Rooms have just been updated and the incredible thing? A standard room -- which includes those stunning water views, starts at just $75 offseason and "goes up to" a bit over $100 in season.